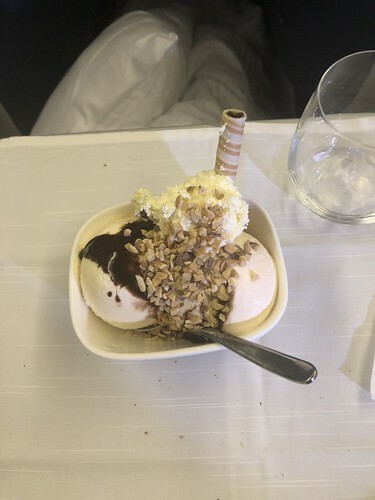 So the food we ate on this trip wasn’t as exciting as say, Italy – and we didn’t eat a whole lot, all things considered … – but I did want to mention some of the stuff we did. Breakfast: egg and oj at the house, coffee and a pastry from either Caribou (B) or Lavazza (me). 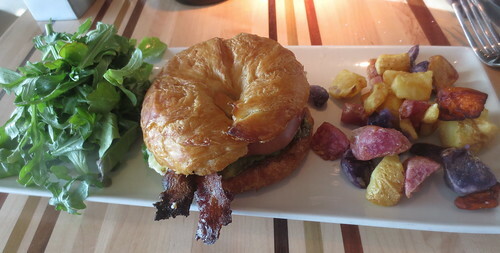 Lunch: I’m pretty sure this was at Le Grand Comptoir in JFK Terminal 4. 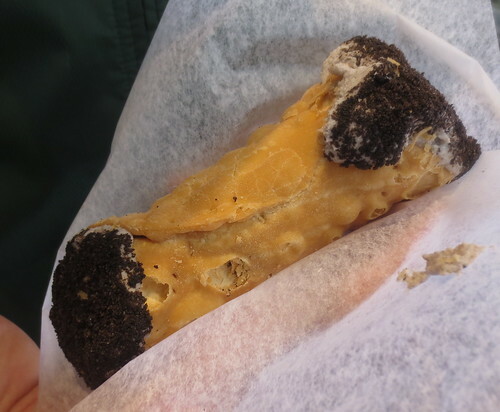 B had … a turkey and brie sandwich, I think? 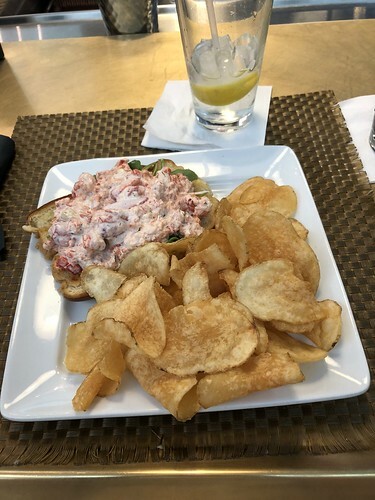 … and I had a lobster roll. Because of course. Snack: random stuff at the Sky Club. 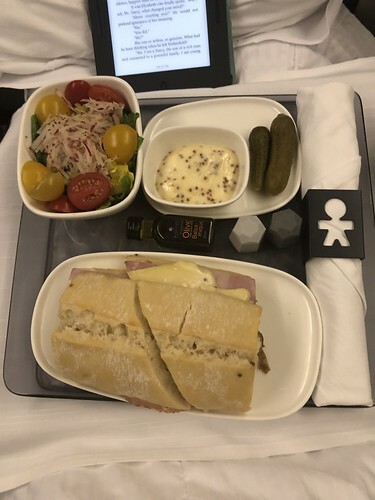 Dinner: Something on the airplane. I think it was chicken with risotto and green beans, but don’t quote me on that. Breakfast: like two bites of my Noosa yoghurt that was in the breakfast snack box thingy we were given. Lunch: yeah, kind of skipped this. Dinner: food at the Belfast Christmas market. 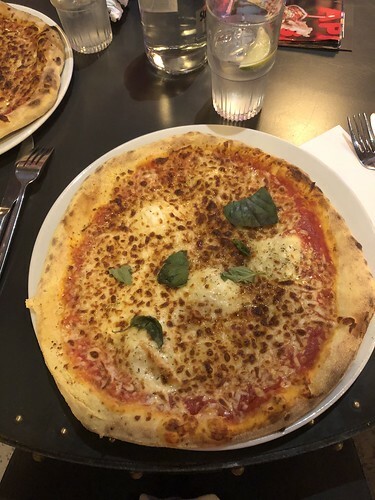 Nothing will ever be as good as Italy, but we try. 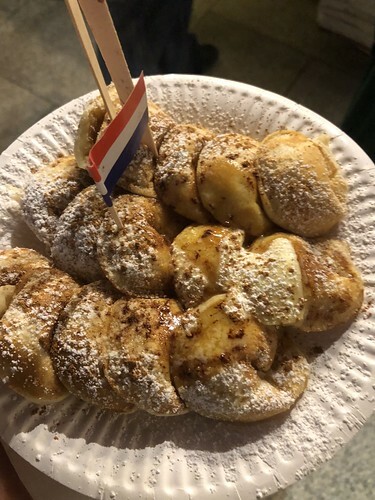 Dutch pancakes with butter and cinnamon. Was meaning to go back and try other flavors, but it never happened. Breakfast: delicious hotel noms (eggs, bacon, croissants, oatmeal) at the Hilton Belfast and then cappuccinos at Caffe Nero. Also not as good as Italy, but fooooooam! 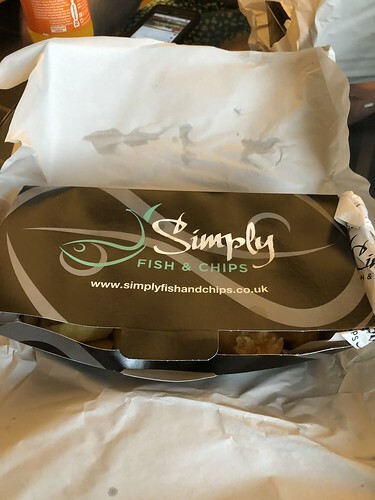 Lunch: Simply Fish and Chips (located in the same building as St. George’s Market). Fish was good. 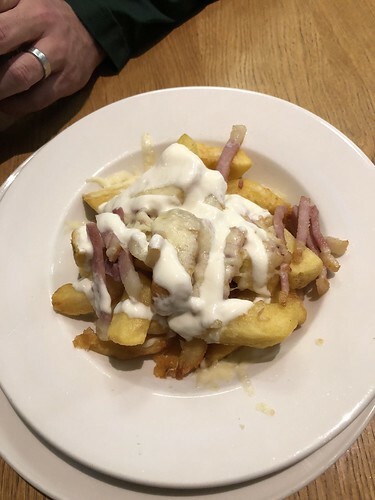 Chips … not as much. Snack: random bites at the BU alumni pregame reception – cocktail weenies, (crappy) nachos, cheese, muffins. Snack #2: loaded fries at the hotel bar just for calories. Breakfast: more hotel noms followed by crappy European Starbucks. Lunch: random sandwiches from a cafe in the bottom of a bookstore. Snack: same random bites at the BU alumni pregame reception. 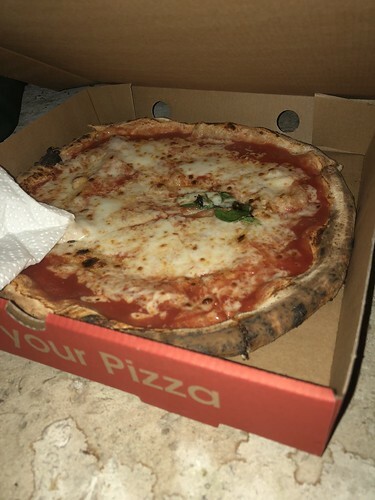 Dinner: pizza and caprese salad from Pizza Punks Belfast. The large whiter blobs are too much mozzarella. Good otherwise though. Touch too much basil. Otherwise delicious. Breakfast: same delicious bites at the hotel. 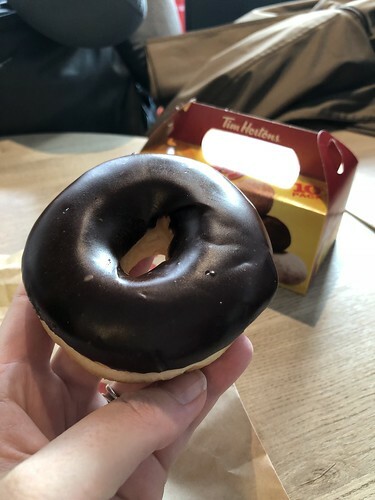 Snack: coffee (for B) and donuts/Timbits at Tim Horton’s. 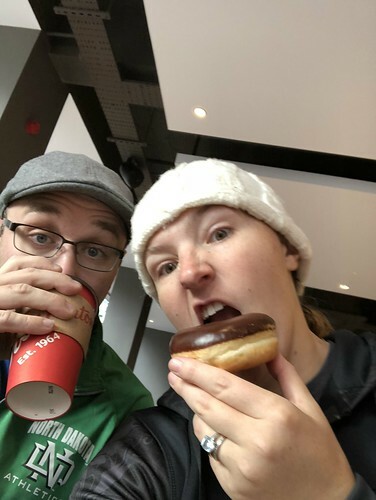 Because I have to keep up my streak of buying doughnuts while we’re overseas together. Lunch: I actually don’t think was a thing. 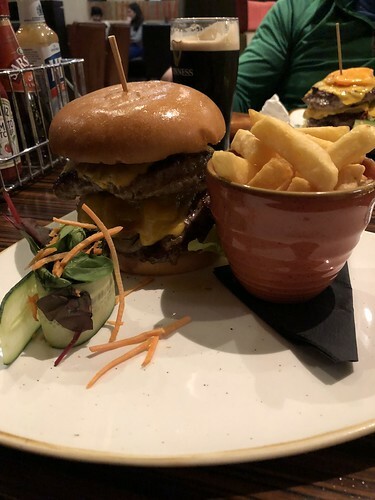 Dinner: burgers and fries at the bar at the Crowne Plaza Dublin Airport. I had to dismantle this in order to eat it by taking off a patty. 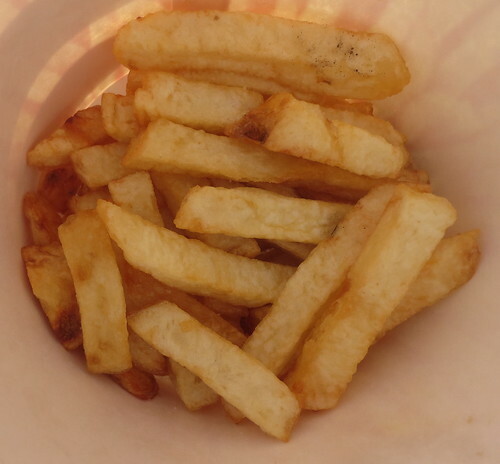 And, once again with the crappy fries. 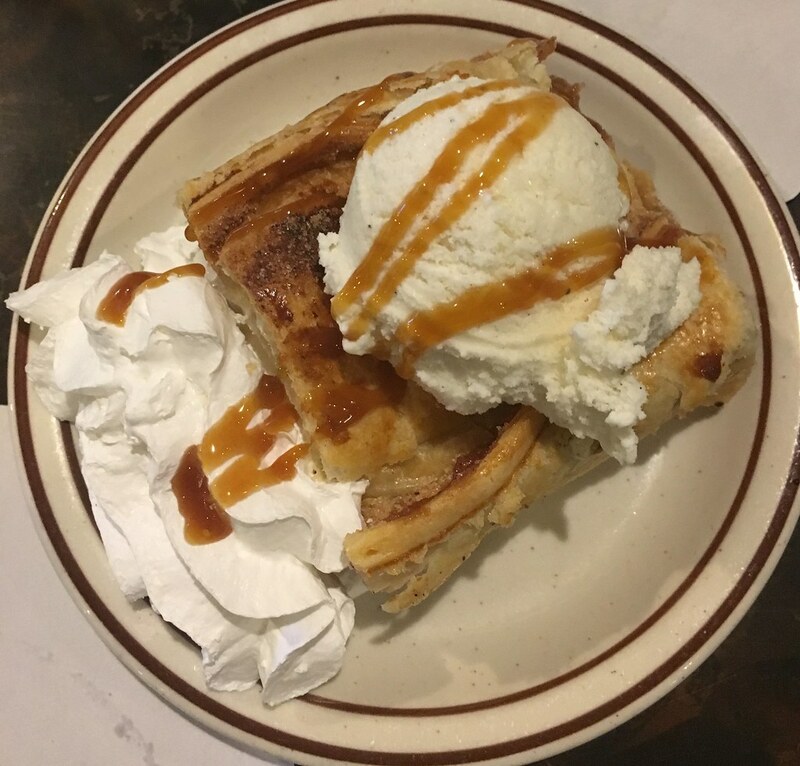 Plus we got some (mediocre) apple thing for dessert. Breakfast: eggs, bacon, and croissants at the Holiday Inn Express Dublin Airport. Lunch: more breakfast foods from some stand in the Dublin airport once we realized we were stuck for another day. Dinner: at Little Venice, an Italian place down the street from the hotel. Cheesy garlic bread for an appetizer. 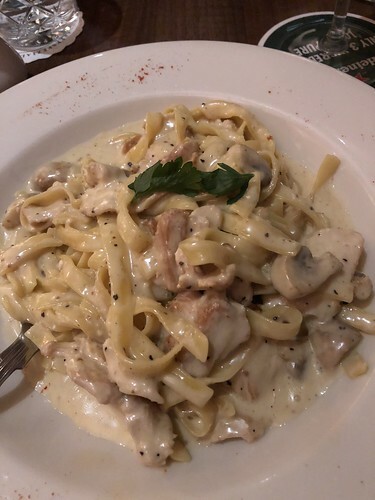 Tagliatelle Pollo Funghi which I had. Good except the chicken was a bit dry. 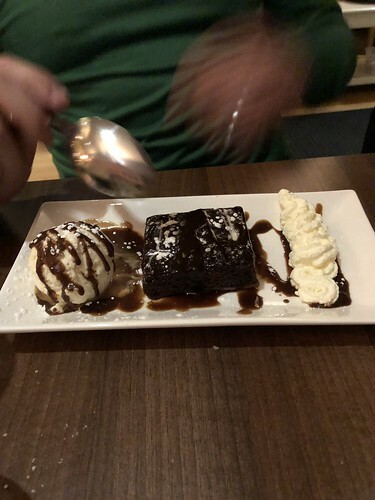 B’s dessert – Chocolate Fudge Brownie. 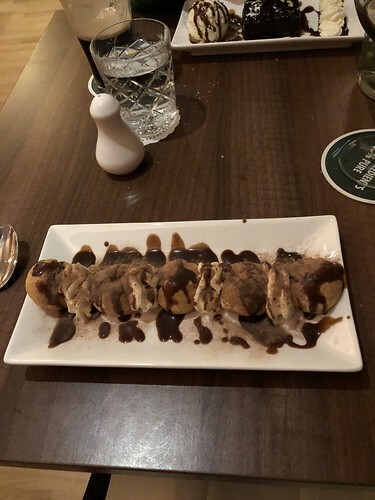 If there are Profiteroles on a menu, I will order them. These were definitely not the best I’ve had, however. Breakfast: same as the previous day at our hotel. Snack: cappuccinos from Butler’s Chocolate Cafe in the Dublin airport. Lunch and subsequent snacks: Pod life. 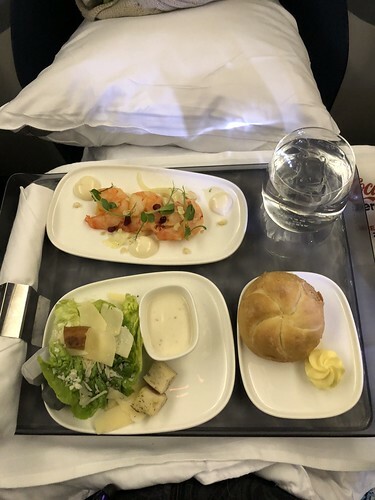 “Lemongrass Ginger Prawns with fennel salad, roasted cashews, pomegranate seeds and wasabi mayonnaise” and “Little Gem Caesar Salad with shaved parmesan cheese, pretzel croutons and caesar dressing.” Neither were good; nor were they bad. “Grilled Beef Tenderloins topped with fresh herbs and demi-glace served with haricots verts and roasted cauliflower.” Beef? was fine. 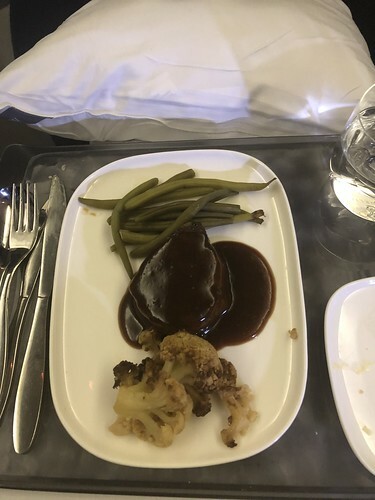 Green beans were better in the back of the plane on the way over and I choked down the cauliflower. Highly disappointing, tbh. Mmm, sundae. Not enough chocolate sauce though. I grabbed a bag of chips out of the snack basket when it came around and we were also given chocolate chip cookies at one point. “Cuban Pork Sandwich pork loin, smoked ham, swiss cheese and dill pickles served on a baguette and offered with mixed green salad.” The sandwich was REALLY good … but unfortunately my salad was frozen so I couldn’t really eat it. Boo. Beyond: very few snacks at the Sky Club because we were so stuffed from the flight over. I did buy a can of Pringles (as well as ate some peanuts) on our flight back to DEN … and I think we just grabbed Chick-fil-a on the way home, but I also don’t quite remember. Denver Restaurant Week has come and gone once again, and B and I were able to sneak in on the tail end of it, trying out Shanahan’s. Shanahan’s is a place we’ve been meaning to go to for DRW for ages, but it’s never worked out. Thankfully, it finally did (and also became March date night; we went this past Sunday). – natural light. A lot of steakhouses are dark holes with very few windows. Shanahan’s, in contrast, has a complete wall of windows which, while we had the light, made the atmosphere a lot less stuffy. – the music. Our favorite Pandora station is called “Beach Bar Lounge Radio,” which is essentially smooth trance. We were joking that Shanahan’s was playing that station with the request for no songs with lyrics, as we heard several of the same songs at dinner that we’ve heard on Beach Bar. – the decor. Smooth, modern, clean. Again, not stuffy like steakhouses tend to be. Essentially, Shanahan’s is a steakhouse for the modern era which is probably why it has survived (and thrived) while others have fallen by the wayside in Denver. To make things a touch more affordable (obviously), we both ate off the restaurant week menu, only adding to it with our drinks (a glass of Pinot Noir for me and a Ketel and tonic for B). I didn’t get a picture, but we both got the Shanahan’s Salad: iceberg, spinach, and romaine lettuces, English cucumbers, heirloom tomatoes, crisp bacon, Champagne herb vinaigrette. It wasn’t bad. 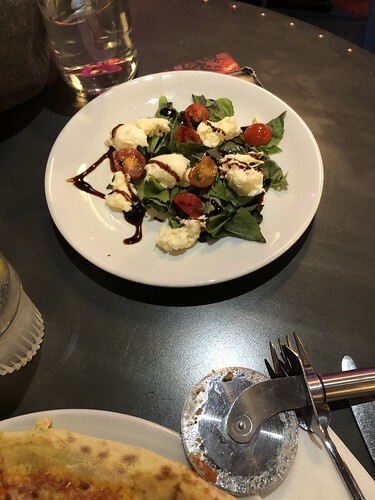 The croutons were a bit odd, so I didn’t eat those. The main course options were a salmon or a filet; we both got the filet. It came with grilled asparagus and roasted garlic mashed potatoes. 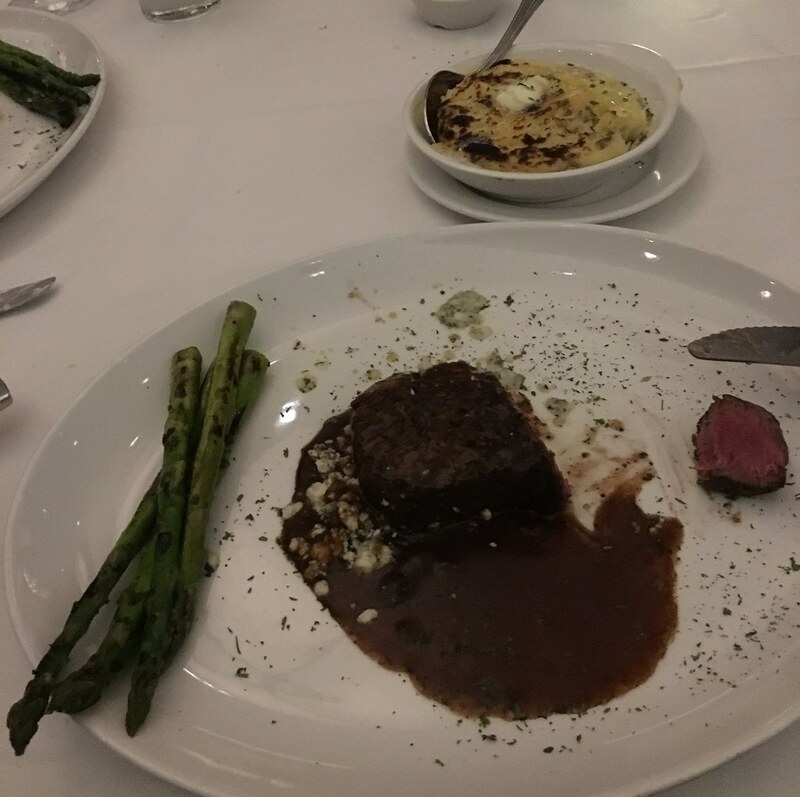 The filet was cooked perfectly. 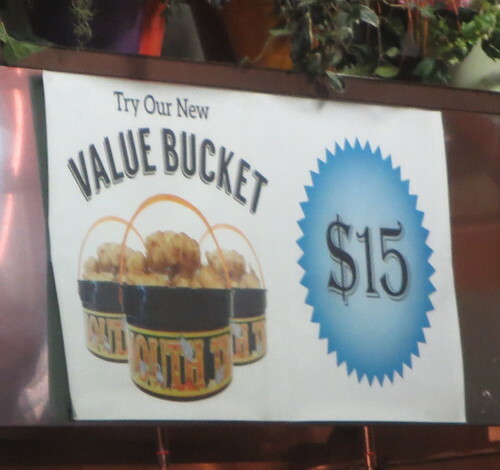 The sauce was okay – I didn’t really eat the bleu cheese crumbles. The grilled asparagus was delicious and while the mashed potatoes weren’t mine (that is, the best ever), they were better than those at Prime Bellagio. 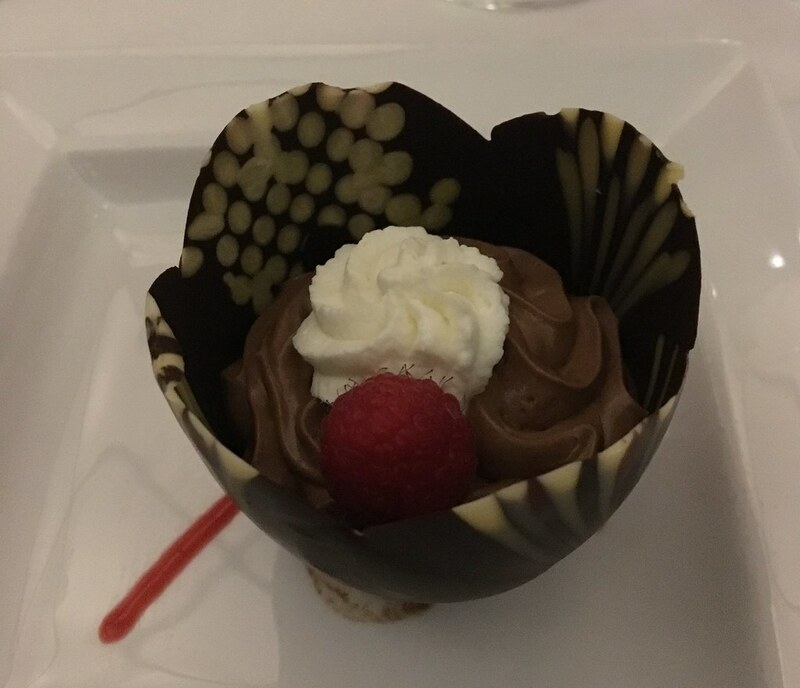 Dessert was an espresso chocolate mousse with homemade whipped cream, a raspberry, and raspberry sauce in an edible chocolate cup. It was rich, but tasty. 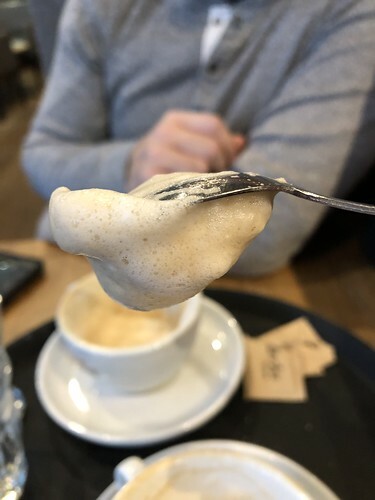 We both thought the espresso either needed to be taken out or amped up, as it was barely noticeable. I ate most of my chocolate cup, but it ultimately proved to be too much for me. 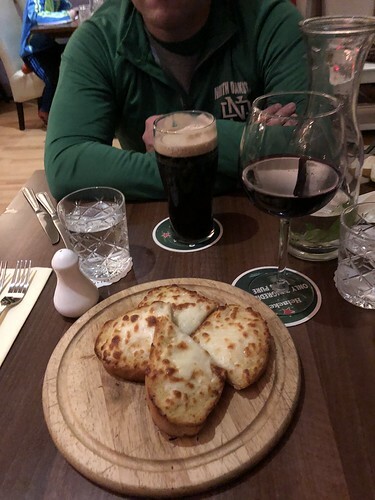 All in all, a delicious meal and we’re glad we finally were able to make it to Shanahan’s. The big question obviously becomes, will we go again? The answer: possibly. 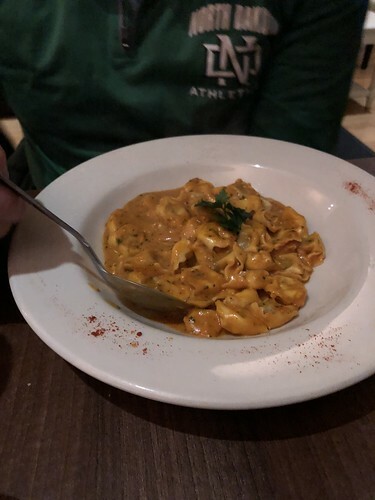 If we feel like a super fancy schmancy dinner and don’t feel like trying a new place, we would consider going back. Especially because their patio is apparently awesome. We tend to get in food ruts. If you pay attention to my travel posts – particularly the ones on cities I’ve visited several times – you’ve probably noticed that we often migrate toward the same places. We’ve tried to get a bit better with this in Las Vegas (and are going to start this in Tucson) … but we’re super guilty of sticking with our old favorites at home in Denver. Therefore, in order to MAKE US PICK SOME NEW PLACES DANGIT, I actually started a page for “new restaurants tried” in the super loose bullet journal I’ve got going this year. First new place tried? Helga’s German Restaurant and Deli, in Aurora. It was a touch obnoxious to get to (sometimes, Google Maps, I swear …), but it’s basically off Exposition sorta behind the train station near Aurora Mall. We went on January 31st at around 6:45 pm. 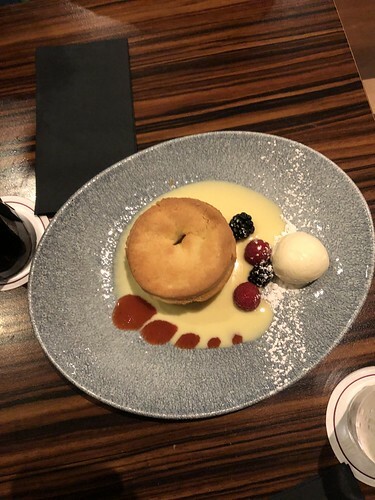 They had some soft pretzels and a beer cheese sauce that looked outstanding, but we decided if we wanted anything extra, we’d rather have dessert rather than an appetizer. Ambiance was what you’d probably typically think of a German restaurant (that is, Bavarian-style). B I believe had a Paulaner Wheat, which he liked. I abstained since I’m not the biggest fan of German beers. We both had schnitzels for dinner – his was the traditional, with green beans and fried spaetzle on the side. 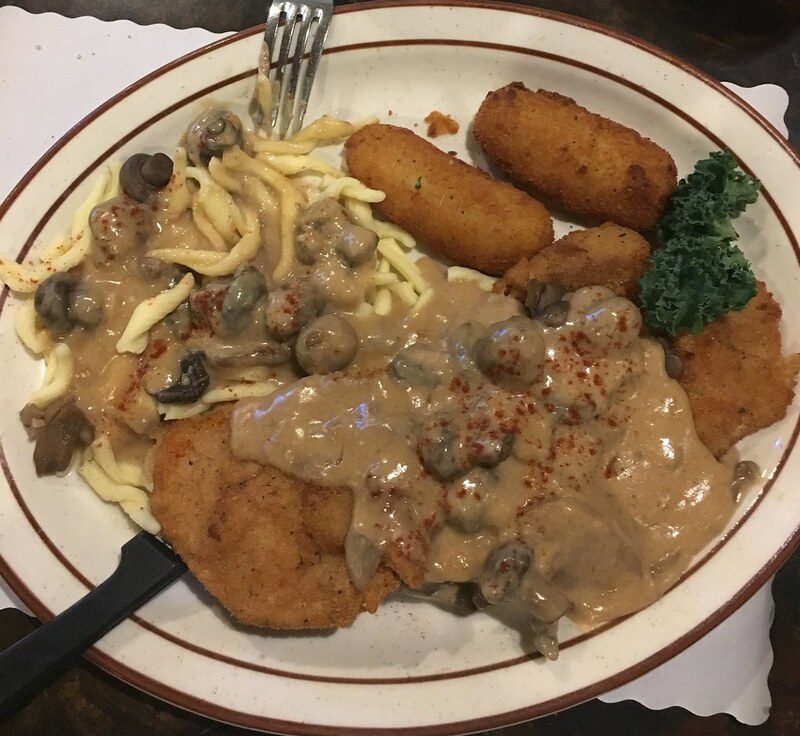 I had the rahm schnitzel – “Your choice of Pork, Chicken, or Veal: breaded or floured, then fried and topped with our chef’s made-to-order sauce using rich cream, mushrooms, and our brown sauce to create a creamy mushroom delicacy” – with more traditional spaetzle on the side as well as the kroketten (fried potato dumplings … which I was hoping would be the smaller potato balls I fell in love with over there ages ago … but alas, no.). Our dinner took a bit longer to come out – even compared to a table that got seated after us – but I think it was probably due to the above-mentioned made-to-order sauce. We’re really pretty patient, but it’s hard seeing people in a larger party than yours who got seated after you get their food first. My only complaint with it was that I wish it had been a bit warmer. Overall, it was a good meal. Would we go back? Probably, but given how heavy it was, not for a good few months. 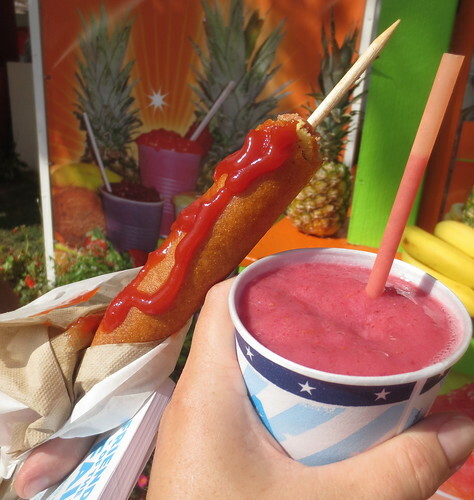 Last year, the husband and I decided to skip Minnesota’s state fair and actually check out Colorado’s. It … was disappointing, to say the least. 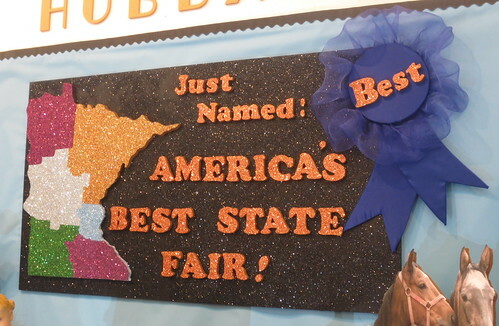 So, this year, we went back out to Minnesota. Much better. It was actually a fairly simple trip, as far as fair visits go. Didn’t really try much new (except the apple version of the Minneapple pie), but enjoyed our favorites. 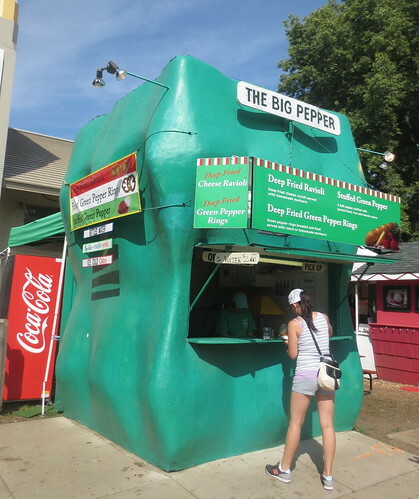 Love the pepper building … even if I’ve never tried their food. 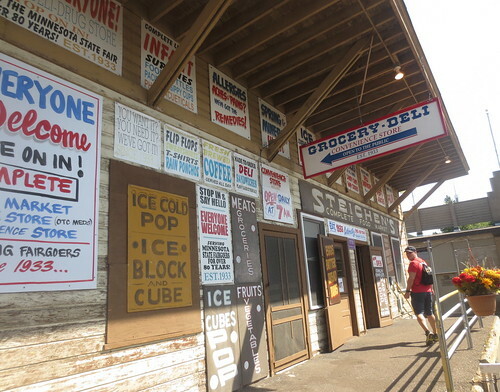 Never ever knew the Fair had a grocery store, but it is a cool little place. 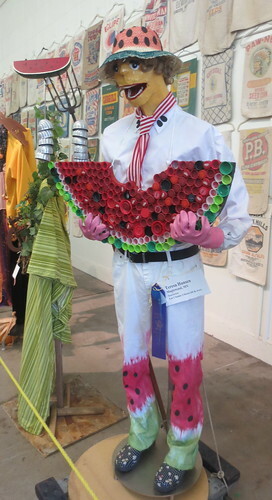 Scarecrow as part of an exhibit in the Agriculture building. The fair had these guys around the fairgrounds to take selfies with. We did not. 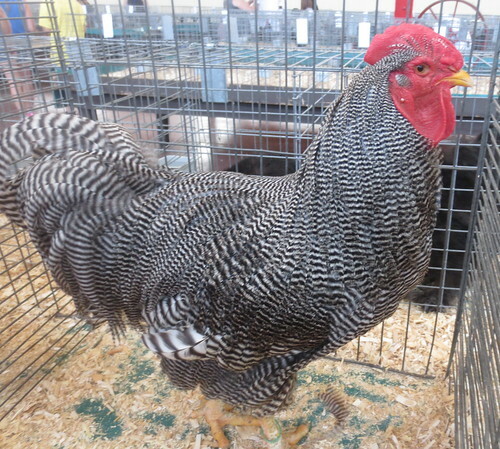 Because it’s not a fair trip without chickens. 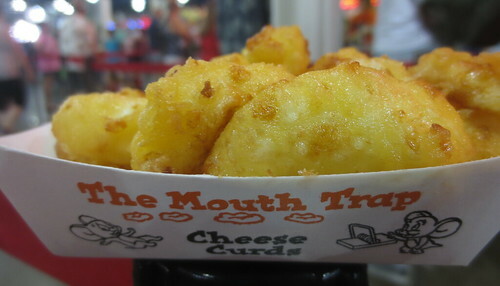 Not a bucket, but a boat of curds. Realized I needed a photo halfway through snarfing these. 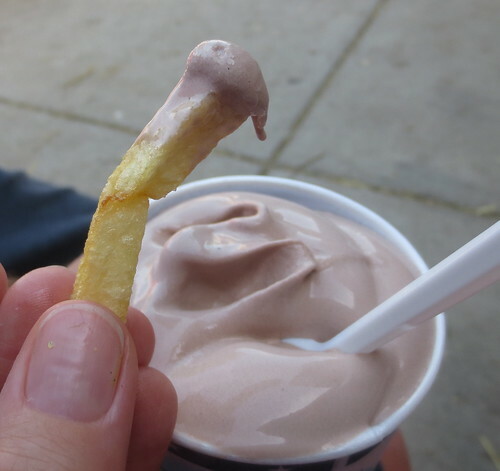 Because french fries and chocolate shakes are a fantastic pairing. 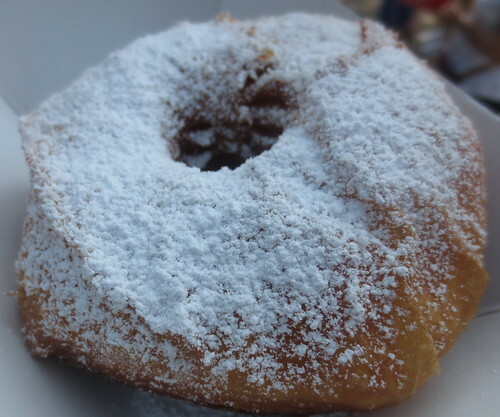 Our deep-fried pumpkin and apple pies. I loved the pumpkin last time, but having the two together made me like the apple way better. Also known as the other stuff we ate. I didn’t remember to take pictures of everything, but I got most things. Day One, if we recall, started out at the hotel for breakfast (and a stop at Dunkin’ Donuts), with Union Oyster House for lunch. Dinner that night was at my favorite Thai place from college, Brown Sugar Cafe. 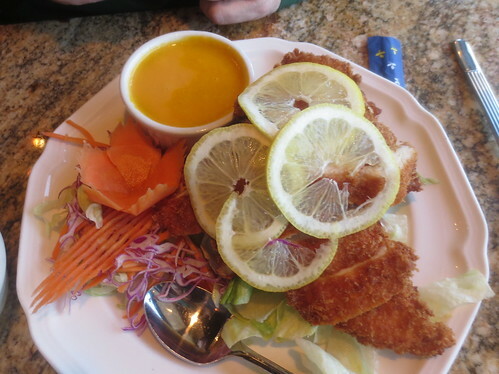 Brandon had the lemon chicken. 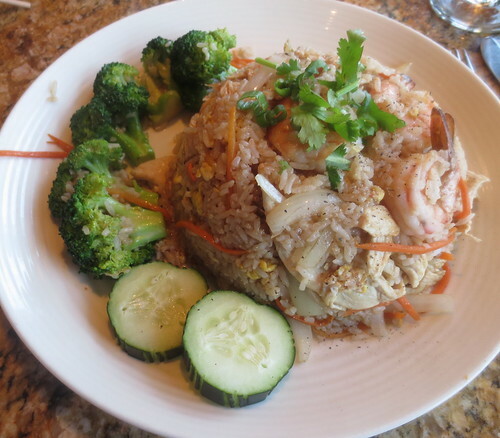 I still dream about this fried rice. I cannot find ANYTHING like it here in Denver. I’ve tried recreating it in the kitchen with no success. I adore this dish so much. Afterward, we went to Angora Cafe for the best frozen yogurt around. Most places have x amount of machines with flavored yogurt. Not Angora. 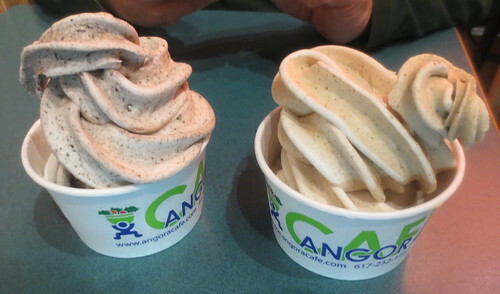 Angora has a plain yogurt that you can mix in whatever flavor you want. I want coffee? They mix it together with ACTUAL coffee. It’s amazing. Brandon’s Oreo on the left, my coffee on the right. Perfect way to end the first day. Day Two we mostly talked about in the previous two posts of the series, but we had a bite at Anna’s Taqueria with friends (I ate a chicken quesadilla) and we also split a delicious Oreo cannoli at Mike’s Pastry. Oreo is the way to go. Day Three we tried Sunset Cantina on the BU campus for lunch, but it was a strong disappointment. I remember it being loads better. Maybe our mistake was going there as opposed to Sunset Grill and Tap (same company, about a mile up the road), but it was a lunch of disappointment after a race of disappointment and preceded my alumnae game of disappointment. Day Four started off with the strong breakfast game, got a bit weaker as we quickly snarfed a mushroom cheesesteak from D’Angelos before we went to Blue Man Group, but the night picked up with delicious dinner from T. Anthony’s. 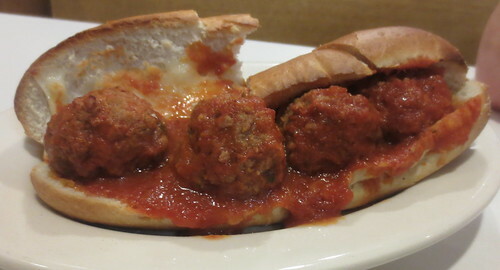 Brandon had a meatball sub. 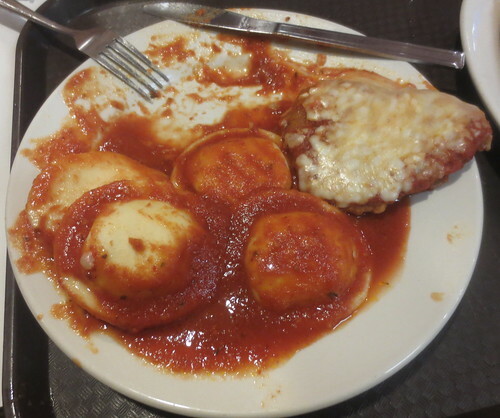 I had the chicken parm, which is just as amazing as ever and is still (in the humblest of opinions) the best chicken parm on the planet. 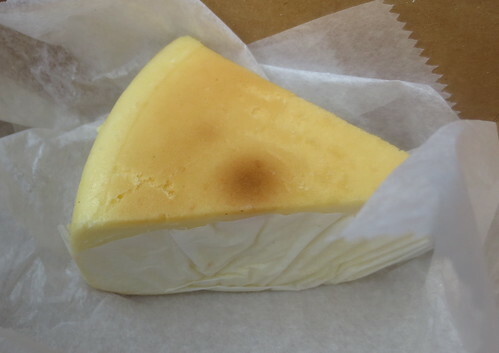 Day Seven saw us split another Oreo cannoli from Mike’s, and we also tried their cheesecake. It … wasn’t bad, but I believe I’ve had better. Maybe it was because we’d been carrying it around half the day before we finally dug into it. As this was also the disappointing lobster roll and dill chowder day, we decided to end Boston on the highest of notes with another stop at Brown Sugar for Thai fried rice, Angora for more froyo, and T. Anthony’s for a slice of the reason I don’t really eat pizza in Denver. Boston, you have spoiled me, food-wise, for so many things. Never, ever change. Back in July for my birthday, Brandon surprised me with a quick jaunt to Vegas. 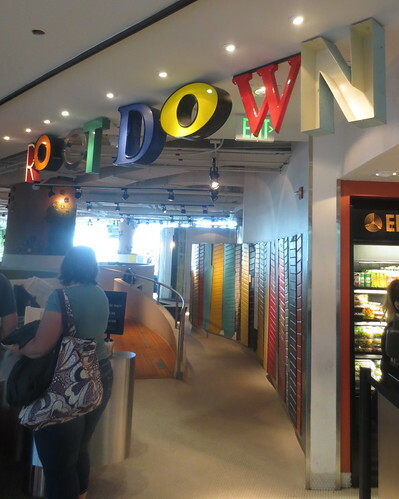 I was totally cool with this … if we got to the airport early enough so we could head over to Concourse C and get breakfast at Root Down. 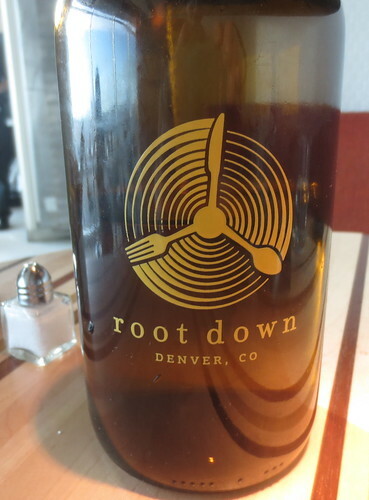 If you recall, we tried their main Denver location back in March (blogged about it in April). So, since I had heard decent things about their breakfast, we decided to take the time and do it. As it should be, the decor/design of the DIA location is very similar to the Denver location in that it’s all been repurposed from something else – most of it with an airport vibe. 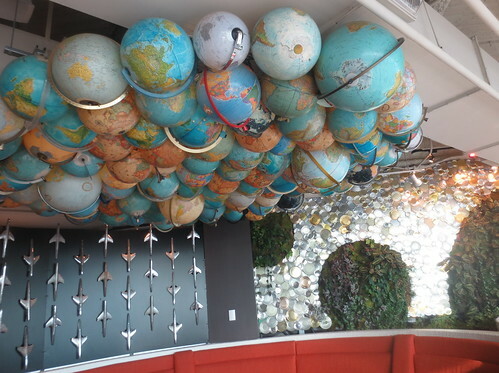 Globes hanging from the ceiling. Totally cool. A menu doesn’t really exist online for the DIA location, but I took pictures of our food anyway. 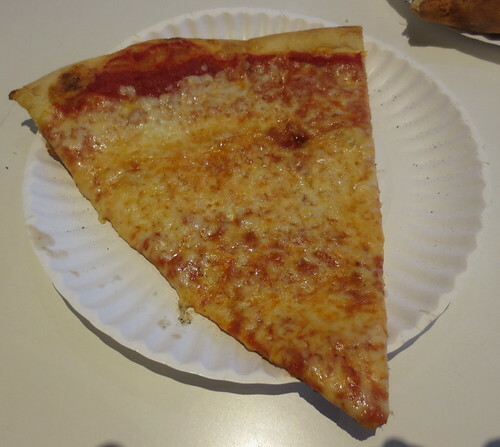 Brandon’s meal. Simple scrambled eggs, bacon, croissant and roasted potatoes. Including purple potatoes – so awesome. Mine didn’t have the scallions and it came with bacon. I also asked for none of the sauce, because according to the waiter’s description, it was spicy, and I don’t do spicy. It was absolutely delicious and TOTALLY better than Brandon’s breakfast. I highly recommend this sandwich. DIA has breakfast options. 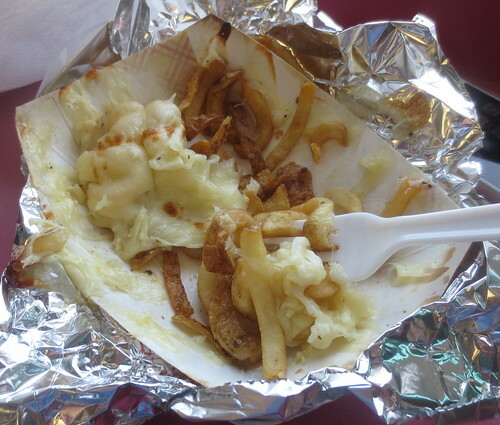 There’s Pour La France!, Einstein’s, McDonald’s, Jimmy’s, Caribou, Timberline Grill … and most of them aren’t terrible. But if you’re going to choose to sit down at a place anyway, get to the airport a bit early and head to Root Down. 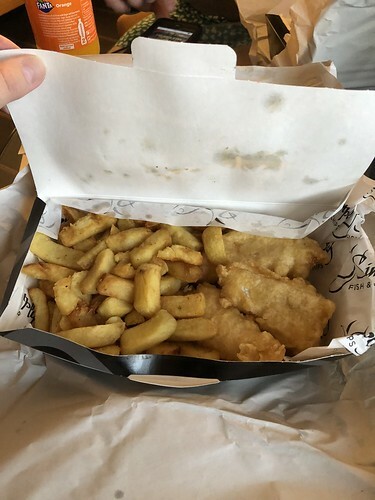 It’s about the same, price-wise, as Timberline Grill or any of the other sit down places, but you know you’ll be getting high quality food that’s insanely delicious. Restaurant logo on the water jug. I first read Michael Pollan this past year when I picked up The Omnivore’s Dilemna. It was a book both Brandon and I had been thinking of reading and then watching “Food, Inc.” just solidified our desire to read it. The Omnivore’s Dilemna was awesome … and I may read it again just so I can review it here. However, this isn’t going to be about that. It’s going to be about another tome of Pollan’s, The Botany of Desire. Every schoolchild learns about the mutually beneficial dance of honeybees and flowers: The bee collects nectar and pollen to make honey and, in the process, spreads the flowers’ genes far and wide. In The Botany of Desire, Michael Pollan ingeniously demonstrates how people and domesticated plants have formed a similarly reciprocal relationship. He masterfully links four fundamental human desires – sweetness, beauty, intoxication and control – with the plants that satisfy them: the apple, the tulip, marijuana, and the potato. In telling the stories of four familiar species, Pollan illustrates how the plants have evolved to satisfy humankind’s most basic yearnings. And just as we’ve benefited from these plants, the plants have also benefited at least as much from their association with us. So who is really domesticating whom? As with The Omnivore’s Dilemna, I really enjoyed The Botany of Desire. I adore Pollan’s writing style, particularly his knack of turning a phrase. The last one mostly because I love tomatoes and thinking of them as disreputable amuses me highly. – the effects psychoactive plants may have had on culture/history of religions/etc. I’m typically a fiction girl (I blame reading too damn much boring non-fiction in college), but I’m really starting to like non-fiction books as they relate to food … particularly if there’s a bit of history involved (marginal history nerd). The Botany of Desire is one such book.